I think they have came out with almost every kind of baby doll you can imagine now. Baby Alive has been around for so many years that I am sure it is a favorite for many little girls. We are giving away a Baby Alive doll below. Good luck everyone! Your little one can feel like a real mommy when she takes care of this adorable Baby Alive Real Surprises Baby Doll! This interactive little doll needs lots of loving care, and she helps your little one by shaking her head to show what she wants and what she doesn’t. Encourage your little one to prepare her “food” and feed it to her. After eating, you know what comes next, and so will she – the Baby Alive Real Surprises Baby Doll really “pees” and “poops” in her diaper! When it’s bedtime, your child can cuddle up with her and give her a pacifier. Watch your little one learn to take good care of her Baby Alive Baby Doll! 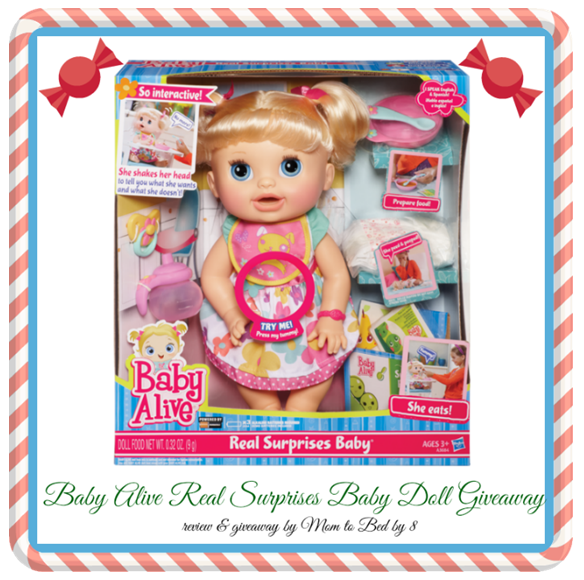 One lucky reader will receive a Baby Alive Real Surprises Baby Doll. Giveaway ends December 20th at 11:59pm, open to US residents only, ages 18+. One entrant per household. Void where prohibited by law. To enter please use the giveaway form below. Good luck! To inquire about becoming a sponsor for one of our fun events, sponsor a post, or anything else, please contact Melanie at melanie@giveawaybandit.com for details. Take a look at our Media Kit to see what Giveaway Bandit has to offer. Giveaway Bandit contains endorsements for products and services, which means when you click on a link that I recommend, I may receive a commission. Not every link is an affiliate link. Giveaway Bandit received one or more of the products mentioned above for free for evaluation purposes and is an affiliate of one or more of the products and banners you will see on this site. Regardless, all opinions expressed are still 100% my own. I am disclosing this in accordance with the Federal Trade Commissions 10 CFR, 255 Guides Concerning the Use of Endorsements and Testimonials In Advertising. Giveaway Bandit Disclosure. Disclosure:YOUR BLOG NAME HERE is not responsible for sponsor prize shipment. Please contact teri@mompoweredmedia.com with questions or to see your business or blog featured on the next big event! I want all the my little pony equestria dolls.